Fibroepithelial polyps, or skin tags, can be embarrassing for the person who has them. They tend to pop up in unwanted (and obvious) places, and they aren’t particularly attractive. But they seemingly come out of nowhere. Is there any way to get rid of them? In this article, we will cover everything you’ve ever wanted to know about skin tags. From what causes skin tags to how to get rid of skin tags, we’ll cover all of your bases so you can stop worrying about them and move on with the rest of your day. What is a Fibroepithelial Polyp? What is a fibroepithelial polyp or skin tag? A skin tag is pretty much just that; it’s a growth of skin. Sometimes these growths can be small and dark-colored; other times they can be a little lighter in color and dangly. They tend to form in areas where the skin rubs, like the armpit area, or where clothing may rub the skin. The important thing to know is that, while they may come out of nowhere, they are benign. Skin tags are not a symptom of a disease and don’t cause any problems other than cosmetic ones. What Cause Skin Tags or Fibroepithelial Polyps? What causes skin tags? The truth of the matter is no one is quite sure what causes skin tags. We do know that they tend to appear where there is frequent skin-to-skin or clothing-to-skin friction. So, places like your armpits, places you have folds on your skin, and around the neck area are common. Interestingly, eyelids are also a common location for skin tags. Because skin tags do appear where there is regular skin friction, those who are overweight tend to be more susceptible to skin tags as they have more areas where skin rubs together. There are a few facts that you should try to remember about skin tags. They are harmless. They may look ugly, but at the end of the day, they don’t negatively impact your health. Skin tags usually occur on the eyelids, neck, armpits, and occasionally within the folds of the groin. Multiple skin tags can appear on your body. Most people will get a fibroepithelial polyp or skin tag at some point in their lifetime. 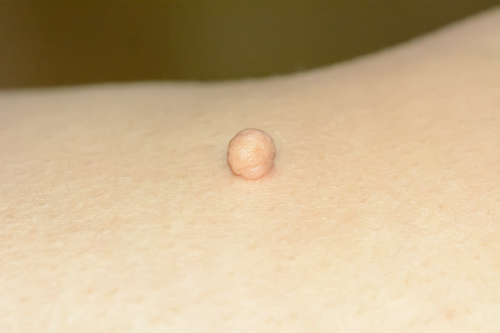 Skin tags are much more common in the obese or diabetic. Skin tags will rarely grow back in the same spot once removed. Beyond obesity and diabetes, there are no other known risk factors that can predict skin tags. There are plenty of treatment options for skin tags. Luckily for people who have skin tags, removal isn’t a big deal as there are a number of medical and natural treatments. In terms of medical removal, there are a few different methods. The skin tag is burned off via electrolysis, which burns off the tag and seals the wound. Liquid nitrogen is used to freeze off the skin tag off. The skin tag is “tied” off from the blood supply, and the tag eventually falls off. The skin tag is cut out. If the skin tag is on the eyelid or near the eye, the procedure will often be done by an ophthalmologist. It is not advised to cut out a skin tag yourself, as there can be some bleeding and the possibility of infection exists. That being said, there are a number of natural treatments for skin tags that don’t require cutting. There are a number of home remedies for the removal of skin tags that are safe to work out in your own bathroom. If you aren’t sure about using certain treatments, consult your doctor who can advise you of any adverse reactions. Tea tree oil is used to remove all sorts of skin conditions including skin tags. Soak a cotton swab in tea tree oil, rub it around the skin tag, and then hold the swab directly on the skin tag for around 10 minutes. Repeat this three times a day for a week or two, and the tag may disappear. Another natural way to take off skin tags is to soak a cotton ball in apple cider vinegar, and apply it to the skin tag for 15 minutes (you can also secure the cotton ball with a bandage). Refresh the cotton ball three times a day until the skin tag eventually falls off. Take one dandelion plant from the root out of the ground and extract as much of the milky-colored juice from the plant as you can. If you use three drops a day on your skin tag, it could be gone within a month. The juice from a crushed garlic clove may also help rid you of a skin tag. Crush one garlic clove and place a cotton ball in its juices. Place the cotton ball onto the skin tag and secure it in place using a bandage just before you head to bed. Do this for two nights on and then two nights off to avoid skin irritation. The skin tag should be gone within a few weeks using this method. These are just some of the quickest home remedies that you can use to rid of a skin tag without leaving any scars or other possible skin issues. As well, you may not want to use any of these on skin tags that are near your eyes or on your eyelids due to their sensitivity. Skins tags are odd. They look weird; no one knows exactly why they form in the first place. Luckily there are a number of ways to treat skin tags and get rid of them fast. You can go with a medically assisted plan or try a natural home remedy. Regardless of your method, skin tags can be gotten rid of if you make the time to do so. “Fibroepithelial Polyp or Skin Tags,” Epain Assist; https://www.epainassist.com/skin/fibroepithelial-polyp-or-skin-tags, last accessed March 29, 2017. Nordqvist, C., “Skin Tags: Removal, Causes and Treatments,” Medical News Today, April 8, 2016; http://www.medicalnewstoday.com/articles/67317.php?page=2, last accessed March 29, 2017. “Skin Tags,” Emedicine Health; http://www.emedicinehealth.com/skin_tags/article_em.htm, last accessed March 29, 2017. Cole, G., “Skin Tag,” Medicine Net; http://www.medicinenet.com/skin_tag/article.htm, last accessed March 29, 2017. Leonard, J., “8 Home Remedies To Remove Skin Tags That Really Work,” Natural Living Ideas, July 29, 2016; http://www.naturallivingideas.com/home-remedies-to-remove-skin-tags/, last accessed March 29, 2017.